Runaway military spending: Who benefits? Download this executive summary [PDF]. Link to Full Report: The Five Percent Campaign (PDF also available). The Han character 武 that is used in many East Asian languages has meanings of both ‘military’ and ‘martial, warlike.’ It is an ideogrammic compound of two characters 止 and 戈. The character 止 means “to stop.” The character戈 means “spear” and refers to weapons in general; thus, “武” is often thought to denote “to stop arms” or “to stop war” (止戈为武). This literal interpretation of the meaning of the character 武 originates in the Spring and Autumn Period (771-476 BC). During this historical period, the four most powerful states—Qin, Jin, Qi and Chu—struggled for supremacy. These multi-city states often used the pretext of aid and protection to intervene and gain suzerainty over the smaller states. Interstate relations alternated between low-level warfare and complex diplomacy. Out of the total recorded 148 states, 128 of which were absorbed by these four largest states by the end of this period. This definition of “武” as “military power means cease-fire” reflects people’s attitude towards war in one of the most conflict-ridden period in Chinese history. The sense that a powerful state (person) should know when to stop force rather than waging wars at will has significantly influenced Chinese political thoughts since. 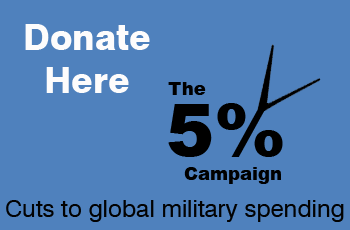 OUR CAMPAIGN OFFERS A FORMULA TO SUSTAINABLY REDIRECT A LARGE PROPORTION OF THE PUBLIC MONEY CURRENTLY USED FOR EXCESSIVE GLOBAL MILITARY SPENDING TOWARDS MEETING GLOBAL SOCIAL NEEDS OVER THE NEXT 20 YEARS. WHY DOES EXCESSIVE MILITARY SPENDING MATTER? Global military spending is at an all-time high of nearly $1.8 trillion a year (2011) – roughly $4.8 billion a day or $249 per person per year. Yet for all this, are we ‘safer’? To take the example of the USA – by far the biggest military spender in the modern history – it has to be asked if the vast amount of tax dollars spent on defence has equated to ‘value for money’ eg peace and stability, either to itself or the rest of the world. The 20th century was a notoriously violent and paranoid one with vast amounts spent on war, defence and security; yet we are currently spending more now than at the peak of the cold war. For this reason, many rightly regard such present day high spending as wasting valuable resources, provoking hostility, fuelling an ever-expanding arms race between neighbouring countries and resulting in yet more weapons proliferation. It has not delivered a safer world – quite the opposite. Redirecting funds captured from ever-rising and excessive military spending would present a significant ‘new’ revenue stream to deal with such mass social need – the amount spent on weapons and war dwarfs the amount needed to deal with hunger, poverty and education globally. According to the World Bank and the Office of Disarmament Affairs, only about 5% of the amount spent annually on defence would have be needed each year to achieve the Millennium Development Goals by 2015. There is growing awareness among the global public – the ‘99%’ – of the collusion between political elites, finance/banks, big business and mass media. They see the resulting absence of accountability, undermining of democracy and the wildly disproportionate accrual of profits to the remaining 1%. Critically, this is also happening against a backdrop of climate crisis and a world majority living in poverty. Within this context, there is an opportunity to remind the global public of the fundamental need to start to see military spending as central to understanding power, poverty, economic collapse, unjust distribution of resources – and to appreciate how much this analysis matters to the ‘development’ agenda. In this sense it mirrors the aims of established campaigns on structural issues such as debt, trade, tax, climate change, and most recently, the ‘war on drugs’. Military spending is not an add-on to these issues – it is implicated in every one of them. Central to this campaign is the need to debate what we mean by ‘defence’. This issue is tackled in this summary paper, and in our full report, The Five Percent Campaign. The new Sustainable Development Goals have been drawn up and, like so many cross cutting issues, we would argue that runaway military spending impacts on many of the 17 SDGs but there remains a great deal awareness raising to be done for this to be more fully appreciated. SDG 16 (of 17) is tasked to promote just, peaceful and inclusive societies with one specific target to significantly reduce illicit arms flows by 2030. A large part of the development sector has dedicated policy and campaigning resources to the Arms Trade Treaty campaign – which is concerned with Small Arms and Light Weapons. The international trade in small arms amounts to a small portion of the overall arms trade and is minuscule compared to total global military spending. The Arms Trade Treaty was nonetheless adopted by the UN General Assembly in April 2013. Now is a good time to influence organisations about how this work could be extended. The UK government will decide whether or not to renew Trident in 2016. Trident offers a key debate around which to work towards to build our coalition for The Five Percent Campaign. As we witness the respective impacts of climate change and austerity, there has never been a greater need to find the resources to fund a global green economy and drive forward a long-term, green, sustainable pro-community effort, paid for in part by savings made on excessive military spending. The movement and displacement of millions of refugees from Syrian, Iraq, Afghanistan, North Africa, West Africa and the horn of Africa has focused minds on the ongoing fallout of intervention in Iraq and other countries as share prices rise for defence contractors and arms manufacturers. Engage and mobilise primarily the NGO community in the UK around runaway global military spending – in particular the development sector. Build on the extensive and longstanding policy and campaigning work of the peace movement, across many inter-connected issues; and for this work to be integral to a wide-based, paradigm-shifting international coalition of common interest that connects it to development, climate and other relevant policy areas into its activity. Grow a global coalition around The 5% Formula with strong, regionally relevant campaigns (i.e. Europe, USA, Middle East, sub-Saharan Africa, Far East) – that share a common understanding of how military spending – and the arms industry by extension – is a globalised industry, further entrenching the globalised nature of power and economic interests. Enable excessive military spending to be seen as a ‘structural’ issue – i.e. one central to understanding power, poverty, economic collapse and unjust resources distribution as debt, trade, tax and climate change. Change the way the public thinks and thereby influence the media debate (from Mumsnet to the Guardian) regarding military spending and what it really means for jobs, security, and geopolitical status. This campaign is part of our ongoing commitment to the issue and sits alongside the Tipping Point Film Fund supported film WE ARE MANY, directed by Amir Amirani (released in 2015) and which explores the untold legacy of the global anti-war movement mobilized at the time of the Iraq invasion. 1. World military expenditure, 2011: $ 1.74 trillion (SIPRI, 2013). World population, 2011: 7 billion (United Nations). II. The 5% Formula: What is it? The 5% Formula is a mechanism to achieve major, year-on-year cuts to global military spending over 10 years and beyond. It is a long-term, sustainable campaign, with a top-line demand that works for civil society groups in every country where there is a perceived value in challenging policies concerning military spending. It would see annual global military spending cut by 40% after the first decade, back to mid 1990s spending levels ie $1 trillion dollars, the lowest in recent history (and even then, ‘low’ is not low enough for many peace campaigners – indeed far from it). This would deliver an estimated $600 billion to be redirected to core urgent human and environmental needs. After the first 10 years, we call upon all nations to adopt the 5% threshold rule to sustainably restrain the global military spending – no country allows any increase in military spending to outstrip economic growth. The 5% Formula would therefore drastically cut annual military spending to $1 trillion dollars in a short but practical period of time and then maintain an effective check on military spending in perpetuity by considerably lagging its annual change behind economic growth. 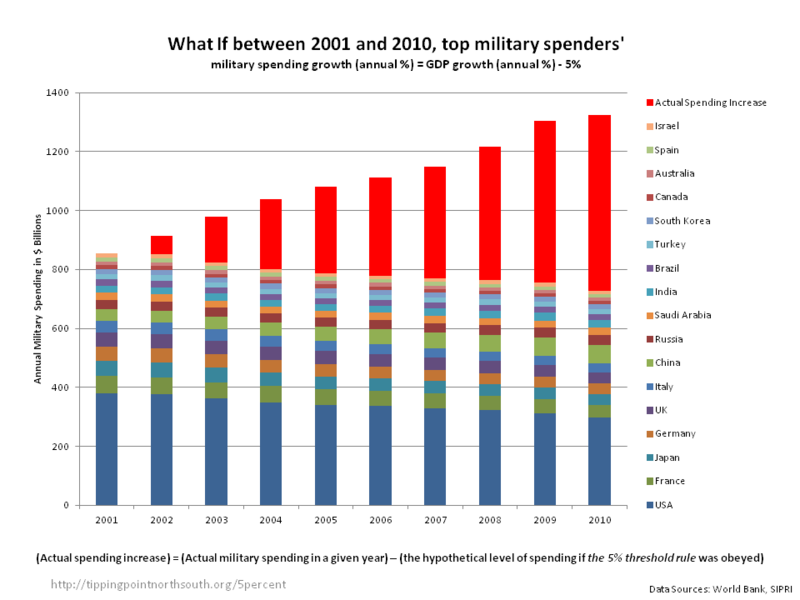 The 5% Formula, in the first decade, sees a call for all nations to cut their annual military spending by 5% every year. Our primary targets are the ‘Top 20’ military spending nations who account for 87% of total spending ($1.7 trillion dollars) in 2012. Top 20 spenders: 5% annual and absolute cuts to their national military budgets. This is equivalent to a compound 40% cut for each nation’s respective annual military spending after 10 years (see the Table on the right for illustration). These cuts are expected to deliver an estimated $600 billion in total to be redirected. The 5% threshold rule is designed to be mainstreamed into budgeting beyond the first 10 years, acting as both a military expenditure ‘dampener’ and an economic growth ‘accelerator’ for all nations, while facilitating and enabling the public to more deeply interrogate the many inter-linked issues of the military spending debate. All nations adhere to a ‘5% threshold rule’, where military spending growth (% change) in a given year is limited by previous year’s economic growth (measured as % increase in gross domestic product, or GDP), less 5 percentage points (5%). 7% growth = only 2% increase on annual military spend. The 5% threshold rule in practise means that no country allows any increase in military spending to outstrip economic growth. Most economies grow less than 3% annually; this effectively translates as 2% annual reduction to their military spending. These savings are then divided equally to fund both domestic and international needs. The fast-growing economies (eg BRICS), according to this 5% threshold rule, might be able to increase their spending in some years if their economic growth merits it (albeit at a much lower rate than they might otherwise do without the threshold). In that case, there will be no ‘cuts’ per se to their military spending to be diverted, we propose that they are therefore required to ‘gift’ a contribution of an amount equal to 2.5% of their previous year’s military spending to fund international development programmes. How would we track this? Governments’ proposed military budgets and actual military spend can be assessed in light of the previous year’s national economic growth and defence budget figures. Statistics for both GDP and the defence budgets are regularly released and readily available in most countries. These figures can then be directly used to judge whether the governments concerned are proposing to spend or have already spent an amount of money on military-related purposes that are not consistent with The 5% Formula. 5. In many ways, military expenditure hinders rather than advances economic prosperity, compared to investments by the government in other productive areas of the economy. The 5% threshold rule ensures a government allocates more of its revenue to grow the economy while still preserving its ability for sensible defence. 6. The 5% threshold rule: Annual percentage change in military spending ≤ (Percentage change in yearly GDP – 5%). Annual economic growth is the % difference between any two consecutive years’ GDP: we assume most economies will not grow more than 5% on average for the foreseeable future. 7. This 2.5% ‘contribution’ is a fixed percentage, no matter how negligible the annual military spending is increased. This is consistent with the requirement for G8 nations who are required to cut 5% of their annual military spending every year in the first decade and to divert these savings to fund both domestic and international needs equally – in effect, G8 nations are diverting 2.5% of their annual military spending to fund international development programmes every year. If the world’s highest military spenders had adopted the 5% threshold rule in 2001, their total military expenditure would have been reduced to $730 billion by 2010, rather than actually increased to £1.3 trillion. The mechanism therefore would have made a significant impact. The difference of $570bn is a significant sum, hence, the campaign demand is reasonable – both as a reachable target as well as delivering meaningful reductions. Using this retrospective approach to illustrate the benefit to society of The 5% Formula enables the campaign to engage society with some of the core issues that underpin the demand, such as: Why do we need to prioritise military spending? How do we define ‘defence’? Who are the real beneficiaries of excessive war spending? $600 billion in first 10 years: how could it be used? The debt cancellation campaign and the financial transaction tax are two examples of how it is possible to win both public and political support for the redirection of monies from one end-use to another, more progressive one. The 5% Formula would have a great deal to learn from both of these international, high-profile and successful campaigns. 8. Sources: World Bank; SIPRI. Military expenditure figures are based on SIPRI’s annual global defence spend calculations and GDP rates based on World Bank figures. The global military spending grew by around 4% every year on average between 2001 and 2010. Like so many cross cutting issues, we would argue that runaway military spending impacts on many of the 17 SDGs but there is a great deal of awareness raising that needs to be done for this to be more fully appreciated. Peace, stability, human rights and effective governance based on the rule of law are important conduits for sustainable development. We are living in a world that is increasingly divided. Some regions enjoy sustained levels of peace, security and prosperity while others fall into seemingly endless cycles of conflict and violence. This is by no means inevitable and must be addressed. High levels of armed violence and insecurity have a destructive impact on a country’s development, affecting economic growth and often resulting in long standing grievances among communities that can last for generations. Sexual violence, crime, exploitation and torture are also prevalent where there is conflict or no rule of law, and countries must take measures to protect those who are most at risk. The 12 targets within SDG 16 are wide-ranging and include those that relate to rule of law, corruption, accountability and transparency, access to justice and extended participation in democratic processes. In relation to conflict there is one target that specifically references the arms trade which reflects the work undertaken by civil society on the Arms Trade Treaty – by 2030, significantly reduce illicit financial and arms flows. Arms Sales: This is a good starting point from which to expand the debate in order to take on board the (much) wider ramifications of this one target within SDG 16. More often than not, the lines that separate the ‘goodies’ (eg governments) from the ‘baddies’ in the arms trade are (deliberately) blurred as author Andrew Feinstein makes clear in his book ‘The Shadow World’. And the use of the word ‘illicit’ also begs a question: where it is the case that arms sales are legal, does it automatically follow that this is a good enterprise between buyers and sellers (ie arms industries, defence corporations and governments)? Approximately 70% of arms sales are made by the P5 members of the security council, the same five nations charged with keeping the peace of the world (USA, France, UK, Russia, China) – and the majority of those arms sales go to the global south. While we all live in the real world and understand that weapons will be made, sold and used, the distinction between ‘good’ arms sales and ‘bad’ arms sales is not helpful, self defence or freedom struggles notwithstanding. And finally, let’s not forget that arms manufacturing, arms sales and military spending are interconnected. So while we do need a reduction in illicit arms flows, we also need a much bigger debate about the ‘legitimate’ billions of dollars spent by governments, in our name (and legally) on overpriced and wasteful hi-end projects ( F35 and Trident to name two) to the multitude of weaponry and hardware deployed to kill or injure civilians and destroy environments and infrastructure along with it. World military spending is at an all-time high – almost $2 trillion annually. We are spending more now than at the peak of the Cold War. At the same time, we have also witnessed massive amounts of taxpayers’ money directed to the bailout of banks and bankers. Austerity policies are being directed at ordinary people, while those responsible for the financial crisis have, in reality, been rewarded for their actions. It is the wider society – especially the youth and the most vulnerable – who are, instead, being punished. According to the Stockholm International Peace Research Institute (SIPRI, 2013), world military spending in 2011 came close to reaching $2 trillion, hitting all-time record of $1,741 billion. The United States spent $711 billion, followed by China ($146 billion), Russia ($78 billion), the United Kingdom ($60 billion), France ($63 billion), Japan ($60 billion), India ($50 billion), Saudi Arabia ($49 billion), Germany ($48 billion) and Brazil ($37 billion). These top 10 spenders are responsible for 75% of global military spending, with the US alone accounting for 41%. It also must be noted that the Permanent Five nations on the Security Council (USA, Russia, China, UK and France) and Germany account for approximately 80% of arms sales – all this while their role on the Security Council is to keep the peace. 9. See Section 2.1.6 The Current Scale of Military Spending in our full report. 10. See Appendix 4.12 Arms Trade in our full report. Arms producing and military services companies headquartered in North America and Western Europe continued to dominate. Forty four US-based arms producers accounted for 60%, while 30 companies based in Western Europe made up another 29% of the total. US arms giant Lockheed Martin tops the list, selling $35.7 billion worth of arms in 2010; the second biggest is the British company BAE Systems – it sold $32.9 billion of arms, which is around 95% of the company’s total revenue that year; Boeing is third with $31.4 billion, which is around half of its total sales for the company most famous for its commercial airliners. Northrop Grumman, the world’s largest builder of naval vessels, is fourth, with $28.2 billion; General Dynamics is fifth with $23.9 billion. 12. Source: SIPRI. These rankings are based on SIPRI Trend Indicator Values (TIVs). TIVs represent the volume of arms transfers and not the financial value of the goods transferred. TIVs can be used to measure trends in international arms transfers, such as changes in the total flow of weapons and the geographic pattern of arms exports or imports. However, they are not comparable to official economic data such as gross domestic product or export/import figures. The ‘unmanned aerial vehicles’ (UAVs) market is projected to total $89 billion worldwide over the next decade. The United States and Israel are the predominant exporters. Interestingly, some of the ‘excluded’ expenditures from national military budgets are – arguably – some of the more valuable uses to which we should allocate military expenditure, e.g. the ‘mopping up’ after the calamity of war. This includes veterans benefits, demobilisation (especially important in developing countries emerging from war as means to support (often young) men in post-conflict regions where the temptation to return to arms is real); destruction of weapons and, indeed, the conversion of arms-production facilities. Some if these activities are currently profoundly underfunded, and could benefit greatly if we were to succeed in diverting some of the excess global military expenditure for better use. 13. Teal Group ‘s 2012 market study. 14. See Appendix 4.15 Drone Proliferation in our full report. 15. See Appendix 4.11 Nuclear Proliferation. There are two myths central to this campaign that need scrutinising. Myth no.1: ‘There is no money’ for the social good – local, national and/or international. This is clearly nonsense. The resources to invest in more equitable communities and by extension, our global society, are there – just not where the majority of people need them to be. On average the industrialized countries spend 3 times as much on defence as on education; in particular, the ratio is 6:1 rather than 3:1 in USA. Many of the world’s poorest countries and fastest growing economies (both measured in terms of GDP per capita) spend much more on defence than either on education or on health. Myth no.2: ‘The west is unsafe and needs big military budgeting’. This too, is nonsense as some of the biggest military spenders (USA, UK, France) are actually among the safest nations on the planet – in spite of and not because of their military spending, which is more often perceived as provocative than proportionate. Military spending is often employed as a way to enforce these countries’ political and/or economic interests overseas, and the increasing use of technology – notably drones – now means that it is ever easier to engage or provoke conflict beyond their own borders whilst enjoying very high levels of ‘safety’ at home. At the other end of the spectrum, in nations or regions where insecurity is high, we see those same ‘safe’ western nations, selling arms and military equipment, further escalating tensions and conflict. Cuts to excessive global military spending do not undermine defence, nor do they amount to ‘no defence’. On the contrary, they promote debate about definitions of ‘sensible’ (non-offensive) defence; what the key drivers of insecurity actually are; and how we best create conditions for real security in the 21st century, including transferring of skills from arms industry to, say, a growing green economy. Defence spending – what we get and what we need – are not aligned. We need citizens to engage with redefining ‘defence’ and to understand more fully how this term masks other related issues (i.e. arms sales), and how this in itself has a corrosive impact on governance all over the world. Contrary to what we are told, there is funding to push back the ‘desperate measures’ humanity and planet find themselves facing. War spending is an elephant in the room – no country should grow their military spend faster than their economic growth – especially in times of austerity. Can’t afford, shouldn’t spend. Increased war spending is a double negative whammy – it increases insecurity AND it undermines economic development / job creation. The fossil fuel economy is not only bad for our health and the planet – it also drives military spending and heightens risk of war or conflict. Global reductions in military spend – with parity – will increase security not lessen it. It will act as a dampener on conflict potential – an all-round confidence-building measure. Peace is a process not an end – $600 billions= redirected to human needs over a 10-year period will – inevitably – move us all forward to a world where the majority are not exploited by a few. We are not ‘planet-playstation’ – we reject the increasing deployment of killing by ‘remote control’ along with the deliberate use of the virtual war games to both entice and train young minds into the business of warfare by simulating the excitement of violence while detaching the physical and mental consequences of killing and harming ‘victims’ from the ‘players’. There are a number of hurdles this campaign will face, both within the wider NGO community (especially the development sector) and the wider world. Below are some key reasons why military spending has yet to be taken up as a cross-cutting, structural policy and campaigns issue for all but those in the peace and conflict prevention sector. The impact and lasting legacy of the peace movement is very much rooted in high points, e.g. Aldermaston; Vietnam; Greenham Common; and the anti-Iraq war marches of 2003. The peace movement comes to public attention in those moments where it – often very effectively – rises to the challenge of imminent conflict or to protest existing conflict. It has been highly effective in mobilising people and public opinion on a variety of issues over many decades. The 2003 protests were more complex – the movement was perceived as a failure for not stopping the Iraq Invasion – yet evidence now shows that its influence on Barack Obama being elected as the President of the United States in 2008, the Arab Spring in 2011 and subsequently the Occupy movement, was considerable. Yet peace movement organisations do not have the same level of day-to-day presence and profile in the wider public arena as do the human rights, environment or development sectors. Despite dwindling public money to fund development, climate change impact and other basic human needs and rights, an opportunity is lost by failing to address military spending savings as a significant ‘new’ revenue stream. While there is always the concern of over-stretching resources and capacity in the decision-making around campaigning (and taking on new ones), the issue of military spending is an ‘elephant in the room’ that needs addressing. There has been a primary focus on small arms and conflict/post-conflict work combined in the belief that it’s ‘not their remit’ to go wider on military spending, despite much evidence that demonstrates the negative impact of excessive global military spending on development. Critically, to take on global military spending means to be interrogating the role of the big defence corporations. This is a major challenge in itself, but one that needs including in the wider development debate given its impact on transparency and accountability, justice and peace – all of which are central to the wider development / pro-poor agenda. However, they may perceive a threat to their income and reputation if they speak out what they may perceive as the ‘controversial’ issue of the military-industrial complex influence on both domestic and international politics. And while they may understand that excessive military spending is a, if not the, major factor hindering an emerging economy’s social and economic progress, they are yet to directly challenge the vested interest of their own (western) politicians and powerful defence industry lobby groups – ones that benefit greatly from runaway spending. Moreover, by not challenging the interests of the politicians and powerful defence industry lobby groups in the developed world, civil society groups in emerging economies may feel doubly powerless to stop their governments (often under pressure) purchasing weaponry without their civil society partners in the developed world bringing equal pressure to bear. 4) All these factors combine to hinder the development of thinking around credible and winnable policy alternatives on military spending. As a result of all these factors, it’s an issue that inevitably lacks internal champions. 5) Over time, the defence industries will mount a powerful campaign to challenge The Five Percent Campaign. As with the campaigns on unpayable poor country debt, trade, tax, and climate change, there will be inevitable resistance from those being called to account. However, a mark of success will be exactly this – resistance from the defence industry sector. The combination of thorough policy work and effective public campaigning will – over time – make headway with the media as well as decision-makers. V. Runaway military spending: Who benefits? Selling the myth of insecurity to their publics while maintaining highly competitive and globalised arms industries ensures that the USA, UK, France and Germany remain in the top 10 of the world’s biggest spenders – a fact closely tied to their role as manufacturers and sellers. With the BRICS nations, plus Japan and Saudi Arabia, completing the top 10, we see how the entire planet is now caught up in increasing militarisation. But who is the enemy? The so-called perceived enemies of the West – i.e. North Korea, Iran, Sudan, Syria, Cuba and Libya – reportedly accounted for less than 1% of the global military spend in 2011. Even if we factor in China’s defence spending and Russia’s spending, the total defence spending of all these states (‘potentially hostile’ to the US and NATO) came to just about 13% of the global total. Professor Linda Bilmes and Nobel-laureate economist Joseph Stiglitz, co-authors of The Three Trillion Dollar War, recently revised their estimation of the total cost of the wars in Iraq and Afghanistan from $3 trillion to astronomical $6 trillion – money that they (and many others) argue would have been much better spent on health and education, with the added benefit of not adding to the national debt. Both wars were almost entirely financed by debt. The financial costs are high, but the most devastating consequences of the wars are the direct impact on people: since the start of the ‘war on terror’, hundreds of thousands of people have died and millions of people internally displaced in Afghanstan, Iraq and Parkistan. The General Accounting Office (GAO) reported that US forces had expended around six billion bullets between 2002 and 2005, that is at least 250,000 bullets for every insurgent killed in the ‘war on terror’. The demand was so large that American ammunition-makers could not keep up with demand, and the Pentagon had to rely at least in part on foreign commercial producers to meet its needs. The wars also took its lasting toll on the environment and the population; for example, just in a three-week period of conflict alone in Iraq during 2003 it was estimated that nearly 2000 tons of depleted uranium (DU) munitions were used. Particularly in Fallujah, radiological and toxic contamination from DU (and other toxic metals) has caused birth defects at a rate more than 14 times the rate experienced by Hiroshima and Nagasaki. DNA mutations caused by DU can be passed from parent to child. Furthermore, the remaining traces of DU in Iraq will remain radioactive for more than 4.5 billion years. 18. The Costs of War project. Also see Appendix 4.1 The Real Costs of War in our full report. The big defence contractors are the ultimate beneficiaries of the current situation: in peacetime or wartime, their shareholders consistently benefit from the business of making arms for governments and/or private buyers. Huge amounts are spent on lobbying; tax avoidance is commonplace and influence over policy-making is greatly enabled via the revolving door connecting defence contractors, defence force personnel and government. Lockheed Martin, “positioned to profit from every level of the War on Terror, from targeting to intervention, and from occupation to interrogation”, saw its monthly average share price rise from $15.32 in January 2000 to $92.91 in January 2013, a sixfold increase. In 2011 alone, Lockheed spent $15 million on lobbying and received $42 billion worth of US federal contracts. The defence industry also paid much less tax than the US federal corporate income tax rate of 35%; for example, Lockheed paid an effective tax rate of 2.8% on $4.2 billion in profit in 2012. 75% of Indonesia’s £400 million debt comes from loans for military equipment. This includes exports of aircraft and tanks later used against the Indonesian people. The Indonesian people currently pay £50 million a year on this debt. 38% of Argentina’s debt comes from loans for military equipment. In the late 1970s, the UK government lent the brutal Argentinian dictatorship money to buy two warships, helicopters and missiles, which were later used to invade the Falkland Islands. 56% of Ecuador’s debt comes from loans for military equipment. 23% of Egypt’s debt comes from loans for military equipment – including military equipment to dictators Sadat and Mubarak in the 1970s and 1980s. During the Kyoto Accords (the negotiations to create binding CO2 emissions targets in December 1997), the US demanded, as a pre-requisite of signing, that any and all of its military operations worldwide (including operations in partnership with the UN and NATO) be exempt from measurement or reduction. After attaining this concession, the Bush administration then refused to sign the accords, and the US Congress passed an explicit provision guaranteeing the US military exemption from any energy reduction or measurement. This has meant, for example, that emissions associated with the wars in Afghanistan and Iraq are unreported as they are ‘incurred’ outside the USA and are therefore not captured in the national greenhouse gas inventories that all industrialised nations, including the United States, report to under the United Nations Framework Convention on Climate Change. Meanwhile, the United States Department of Defense is one of the largest single consumers of energy in the world, responsible for 93% of all US government fuel consumption in 2007. Some efforts are being made to curb this. President Obama told the American people in his June 2013 Speech on Climate Change that ‘the Department of Defense – the biggest energy consumer in America – will install 3 gigawatts of renewable power on its bases, generating about the same amount of electricity each year as you’d get from burning 3 million tons of coal’. According to the 2005 CIA World Factbook, if it were a country, the Department of Defence would rank 34th in the world in average daily oil use, coming in just behind Iraq and just ahead of Sweden. As part of this, the B-52 Stratocruiser, with eight jet engines, guzzles 500 gallons per minute – 10 minutes of flight uses as much fuel as the average driver does in one year of driving. The ‘war on drugs’ incurs massive military costs for the USA (and by extension for its ‘allies’ in this ‘war’). Billions of dollars are wasted globally on ineffective law enforcement, undermining international development and security, resulting from an enforcement-led approach that puts organised crime in control of the trade. The ‘war on drugs’ is deeply entwined with the ‘war on terror’; while the US/NATO occupation of Afghanistan has cost the coalition hundreds of billions of dollars, Afghanistan has quickly became the world’s first true ‘narco-state’. Between 2001-2006, Afghanistan’s opium production jumped from 185 tons to 8,200 tons, a remarkable 53% of the country’s GDP, and 93% of global heroin supply. The UK took a lead role in counter-narcotics, and sent troops to Helmand (the biggest poppy-cultivating province by far). Deployment in Helmand since 2006 has cost £15 million per day. Despite this, the cultivation of opium in Helmand has tripled from 25,500 hectares of land in 2005 to 75,000 hectares in 2012. The drug problem is not going away, but the coalition’s presence continues to cost billions of dollars per year. And according to a US Senate report (2011), the Latin American war on drugs has ‘largely failed’. From 2005 to 2009, the majority of counter-narcotics contracts in Latin America went to only five major defense contractors: DynCorp, Lockheed Martin, Raytheon, ITT, and ARINC, who collectively received contracts worth over $1.8 billion; many of the contracts were awarded on a no-bid basis. The Department of Defense has spent $6.1 billion since 2005 to help detect planes and boats heading to the US with drug payloads, as well as on surveillance and other intelligence operations. A long overdue and fundamental re-evaluation of the war on drugs – a ‘war’ started under the Nixon administration – will inevitably have a knock-on effect on the global military spend and will especially impact on both the defence industry and the private military industry. We need a much more ‘sensible’ approach to defence and (sustainable) security. Cuts to excessive global military spending do not undermine defence and security, nor do they amount to ‘no defence’ – rather they promote debate about definitions of ‘sensible’ defence; the drivers of insecurity; and how best to address the whole notion of what defence means in the 21st century. challenge traditional notions of what we mean by defence so they are fit for a 21st century reality. address the real underlying causes of conflict (foreign policy failures; poverty and inequality; commercial exploitation and resource wars). question the perennial issue used to defend defence spending – i.e. protecting jobs in the defence industry. Instead, we need to open up the debate about transference of high-tech weapons-related skillsets to the high-tech (comparable) needs of the green economy. The language of defence, and of security, is inevitably loaded, depending on who may be defining it or defending it. Spending billions on ‘defence’ will not deliver security as 9/11 proved. On the other hand, security means one thing (often socially controversial) to national intelligence services, and quite another to pastoral farmers in climate-challenged communities. Beyond the world of extremes exemplified by PRISM or the billions spent on the F35 Strike Fighter there is a genuine and fundamental question that underpins the debate on military spending – how much is ‘enough’ for any given nation’s true security needs? This is a much marginalised debate in the mainstream media, which in turn closes down opportunities for wider society to comprehend ‘alternative’ ways of understanding what ‘defence’ and ‘security’ can mean. In recent years, we saw China buck a trend where its nuclear missile policy was based on minimal deterrence (ie a ‘sensible’ policy on missile numbers) and there are many conflicts where the solutions (indeed the root causes) lie more in the need for economic and environmental justice; and oil as a driver for conflict is now an everyday understanding – so a move away from the fossil fuel economy would also play a major role in making the world a less volatile and less militarily armed place. Below are two approaches which chime with the three key points above. A Non-Offensive Defence policy is one alternative that breaks with this subordinate relationship [with the USA] and allows the UK to make an effective contribution both to new international security challenges, and to international disarmament. The focus is on territorial defence and a contribution to an EU peacekeeping and reconstruction force that can carry out UN endorsed humanitarian interventions. Under this policy, major offensive platforms, including the follow-on Trident ballistic missile system, aircraft carriers and conventional nuclear submarines would be cancelled and the UK would be a leading proponent of a new international security architecture based on global disarmament. There would be the potential for major annual savings of between £3-4 billion on military expenditure by 2012, available for the ‘national needs’ programme of civil investment. Sustainable security goes beyond analysis of threats to the development of a framework for new security policies. It takes global justice and equity as the key requirements of any sustainable response, together with progress towards reform of the global systems of trade, aid and debt relief; a rapid move away from carbon-based economies; bold, visible and substantial steps towards nuclear disarmament (and the control of biological and chemical weapons); and a shift in defence spending to focus on the non-military elements of security. This takes into account the underlying structural problems in national and international systems, and the institutional changes that are needed to develop and implement effective solutions. It is unavoidable that this proposal gives great attention to the USA’s military budget – and by extension – the US military’s reach and influence over the rest of the world’s decision-making on both arms imports and foreign policy. The USA accounts for almost half of global military spending – almost as much as the rest of the world combined – and is consistently responsible for more than one third of global arms sales. By extension, USA military budget trends (increase or decrease, depending on domestic and foreign policy-making) influence budget trends in the rest of the world – the Iraq invasion is evidence of this. Contrary to many people’s perception, polling indicates that a majority of Americans support a significant reduction in their military spending. One representative survey in 2012 found 76% of respondents called for 23% cut on average. Equally, there has been a great deal of thinking done in the USA as to how the world’s largest spender can make cuts to its military budget – this is echoed by campaigners in the UK and other parts of the world who have studied how cuts can be made and savings redirected to more productive social uses. There is ample evidence out there that indicates how and where cuts can be made. Along with this is ample research to show that governments get much more comparative value for their ‘tax dollars’ by spending in non-military sectors than they do with current military spending. 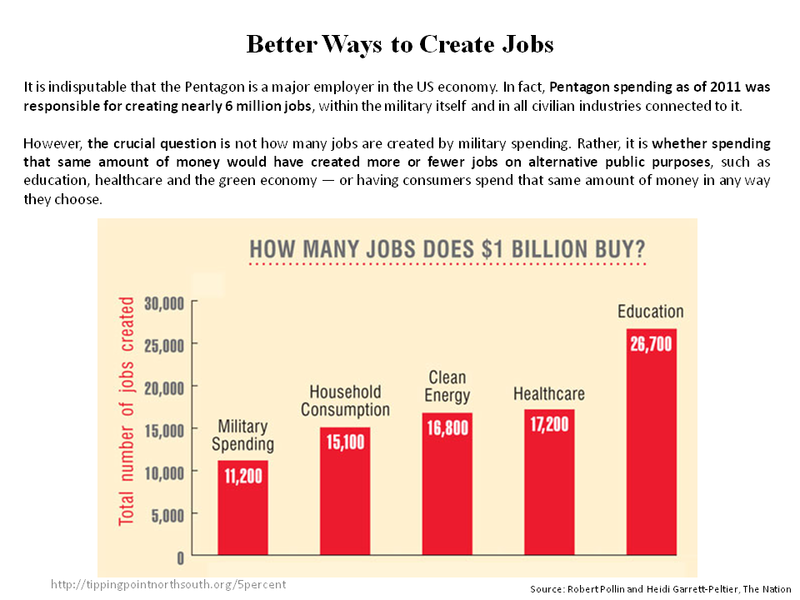 Specifically one study shows that military spending per $1 billion creates the fewest number of jobs, less than half of what it could generate if invested in education and public transport. Top 20 spenders: Our first target is ‘Top 20’ military spending nations. The biggest spenders account for a staggering 87% of global military expenditure and more than 85% of the global arms trade. We call on them to cut 5% year-on-year for the first 10 years. Middle East: We also believe the campaign will also have a particular (and different) resonance, post Arab awakening/uprisings, for civil society groups in the Middle East. Military expenditure in the region has been growing exponentially, greatly influenced by USA foreign and security policy, and its spending in the region (including its military aid support to Israel). Israel’s peace movement and Israeli/Palestinian peace initiatives would be key to some of this work. Sub-Saharan Africa: Civil society experience of military expenditure in sub-Saharan Africa is – generally speaking – one of procurer from richer G8 nations, who in turn profit hugely from selling arms to (often poor) African nations. Small arms also proliferate. In a 2008 report by IANSA, Oxfam, Saferworld entitled Africa’s Missing Billions, it was estimated that armed conflict cost Africa $18bn annually. Brazil is spending more on arms now that its economy is growing, despite the historic truth that it does not have a history of border concerns/‘natural enemies’. So why the spending increase? Could Brazil be encouraged to offer hope for a different approach? India: All major arms sales nations see India as an important new market – especially the UK and USA. In February 2013, representatives of a dozen British or partly British-based companies with defence interests accompanied David Cameron on his trip to India: Rolls-Royce, Serco, Bae, Eads, Thales, Atkins, Cobham, Jcb, Strongfield Technologies, Mbda, Ultra Electronics. This proposal draws inspiration from many existing – often longstanding – campaigns both here in the UK and in the USA, and which address a wide variety of related military spending issues. 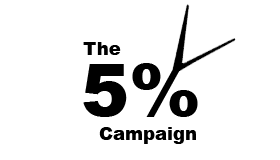 Many are listed and explained in our main The Five Percent Campaign report. It is our hope that The 5% Formula (the 5% absolute annual cuts and the 5% threshold rule) can offer a top-line campaign idea in which campaigners can see value and a way to add more value / draw more attention to their work; we also hope it is one that offers a fresh , overarching demand around which we can campaign together, where ever in the world we are. Integral to this, is the recognition that the business of military expenditure and, by extension, defence industry sales (at home or overseas), is a truly globalised one which – we feel – demands a globalised, co-ordinated response, and one that can present the ‘peace’ issue anew to a wider audience (media, public, policy-makers) in a way that brings together those with many years of experience on this issue and newcomers to the issue. Currently 60% of global arms sales go to developing nations from a handful of rich nations. In the case of many (often smaller but not necessarily) developing nations, or nations whose defence relies on buying from rich nations and their respective defence industries, we would like to suggest a ‘sub-campaign’ – ‘Don’t Buy, Don’t Sell’ – which would be a ‘solidarity’ campaign between campaigners in the north and south. At the time when Greece was on its knees, Germany and France included military sales as part of the bailout package conditions. The business of military spending – and in this regard, the line between government and defence industry activity is a very blurred line indeed – whether domestic or as part of arms deals, is more about contracts and profits than ‘defence of the realm’. the ‘business’ of the defence industry does not advance or respect notions of ‘sensible defence’ spending when so much profit is to be gained from contracts and/or war. Its close relationship with governments around the world is central to this and we need the wider public to share the concerns of civil society groups working on how our taxes are spent with regard to the military. We also need to challenge the notion that defence spending is de-facto good for jobs and the economy. increased inequality around the world where the rich (individuals, businesses, nations) seek to consolidate their wealth while global poverty is widespread undermines local, national and international security and well-being. Over 900 million people in the world are hungry; 1.5 billion people subsist on less than $1.25 per day. Furthermore, over 40% of people in the world live on less than $2 per day. And this is not just confined to the global south – 40 million Americans are on food stamps in 2012.
the connection between oil as a driver for both conflict and increased military spending is clear. The fossil fuel economy increases instability and likelihood of conflict and therefore increased military spending. reducing the power and influence of the defence industry over governments and society. diverting military spending into a transformative funding stream, delivering social justice and meaningful investment in conflict prevention and peacekeeping. diverting military spending to deliver a sustainable, non-fossil fuel, green economy that addresses the many dimensions of climate (in)justice. We believe that this international campaign, and its 5% Formula, allows every nation – relative and proportionate to its economic growth and GDP – to share in ‘sensible’ defence budgeting, with the long-term effect also acting as a dampener on arms races. In the past 10 years, the world economy grew by roughly 2.5% per year on average, but global military expenditure increased on average by around 4% annually. Military spending is one of the least efficient ways of investing our limited resources to advance economic growth and prosperity; thus, the significant outpacing of its increase to the economic growth is harmful to the real economy and consequently society. To paraphrase James Tobin, there is therefore the need to ‘throw some sand in the wheels’ of our excessive but highly successful international military-industrial complex. For this purpose, our proposed 5% threshold rule will serve as a brake mechanism embedded in the budgeting process, deliberately intended to slow down runaway military expenditure increases around the world. In the meantime, money saved will be redirected to productive areas to further economic and societal advancement. The 5% threshold rule is our first step towards a prosperous economy based on sustainable sensible defence and the efficient use of our precious but finite resources. If – as we hope – we can extend the initial proposed first 10-year framework, then the global public could call upon their governments to continue a sustainable downward trend in military expenditure, saving further monies for constructive reallocation to areas of greater human need. This campaign concept is fair, proportionate, just – and long, long overdue. It speaks to a multi-polar world where reduced military spend equates to a safer world, and where the notion of non-offensive defence and sustainable security are a powerful combination. Redirecting funds saved from excessive military spending towards more vital areas – domestically and internationally – we can deliver a much more real and tangible security than we have at present, and in doing so, see a rebalancing and redistribution of resources. Excessive global military spending is a structural issue and the defence industry sector is at the heart of it. Like odious debt, corporate tax evasion, the fossil fuel industry and unfair trade rules, it too works against the interests of the populations of the global south; is all too often (ab)used as a tool of trade and/or foreign policy; it also places an excessive financial burdens on citizens at a time when public services are being eroded all over the world. For this reason, greater scrutiny placed upon the defence industries sector within this structural framework can only serve the global common good. Read Full Report: The Five Percent Campaign (pdf also available).